Me & my BFF's circa 1985. I'm the one in blue with the green lei. In my last post, I wrote about my nephew Alec’s recent high school graduation. As I sat waiting inside the local college field house, miles away from the actual school my nephew attended, I couldn’t help but think about my own graduation in 1985. I remember looking at my fabulous white high-heeled pumps and thinking about my tan. My tan was very important to me, as tans were to many of us back in the mid-1980s. We were not a very serious bunch. I mean, we were serious but in an 1980s kind of way. Which was not very serious. Yeah, we were going to college – but we didn’t know what the hell we were doing. At all. Maybe that was just me. But seriously, I don’t think so. Where my nephew’s graduating class was focused, we were distinctly goofy. Of course some of us were more self-propelled than others, but as a class, we were more about fun. I may be making this up but I kind of remember someone pretending to trip and possibly even staging a fall as he walked to get his diploma. I wore a green lei around my neck during the graduation ceremony. On two separate occasions, the vice principal told me to remove it (and I did), but I slipped it back on before I walked across the stage for hand-shaking and hugs. 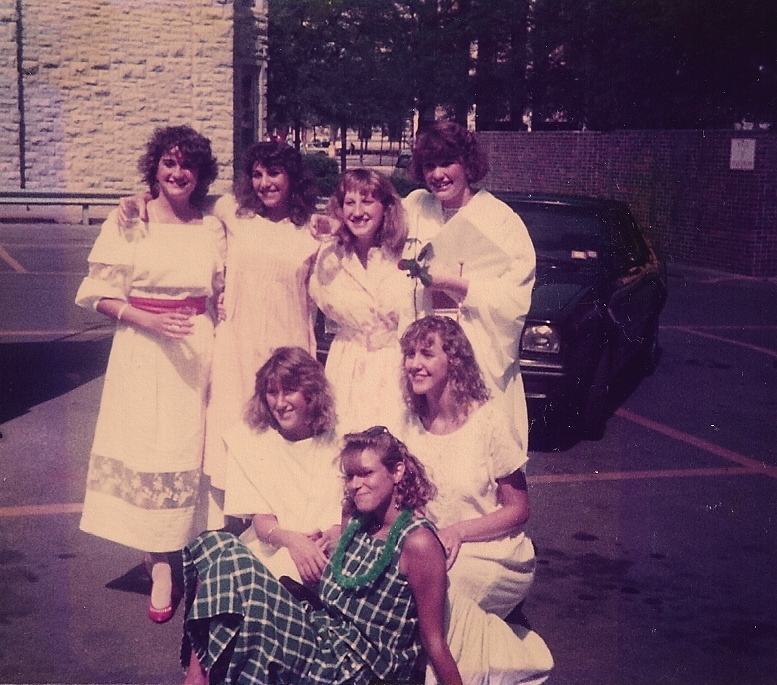 In 1985, I was more interested in the social interactions that high school had to offer than its academic challenges. I joined the “fun” clubs. I was a cheerleader. I danced and rode horses. I also got a lot of detentions; I even managed to earn myself a 3-day in-school suspension. Hell, I wore blue to graduation when we were clearly instructed to wear white or light colors. As a group, we did a lot of pushing the proverbial envelope. In contrast, my nephew and his peers seemed pretty serious. Maybe they have to be. Given the current economic prognosis, they can’t afford to mess around the way we did in the decadent 80s. The night of Alec’s graduation, as we celebrated his accomplishments with pizza and watermelon, I was surprised by how content Alec was to just hang out with his family. He played his ukulele, chatted with his grandparents, sat outside on a chunky patio chair with the men, their voices blending together in a low hum. He seemed unfazed that he was leaving for camp the next day. He said he wasn’t too worried because he knew he would be able to keep in touch with his closest friends. Immediately after my high school graduation, my clan of Best Friends Forever (The “BFF’s”) gathered in a parking lot to sip champagne from plastic glasses, and I remember feeling a tremendous sense of relief and freedom. Along with a side order of sadness. Because I really didn’t think I was going to see any of my them ever again. Seriously. I didn’t think we were going to make it to our 10 year reunion. But on a less morbid level, there were no cellphones back in 1985. No Facebook or Twitter. No texting. I remember smiling big but feeling internally frantic. I could feel change on my skin as sure as I had felt the sun baking my shoulders for all those weeks leading up to graduation. Just like my nephew, I packed my duffel bag and trunk and headed off to (same) summer camp where I planned to work for 8 weeks as a counselor. Unlike my nephew, I felt loss in my bones. I imagined myself standing in line waiting to use a dormitory payphone. But I knew I would never have enough quarters to call my friends as much as I would like. I also knew that even if I called, the odds were, they would not be around. I knew I would have to find new people, and that I would have to work to make new friends. But I also accepted this as the natural order of things: growing up meant breaking bonds to form new ones. After speaking with several graduates of the class of 2011, I realized that they are less sad than we were. With the advent of social media, friends need never disconnect from one another. Unless a person wants to become invisible, it is absolutely possible to remain in touch with one’s friends from high school. On a daily basis. It remains to be seen if all this connection will be a blessing or a curse. I wonder if today’s students will remain perpetual teenagers, clinging to their childhood friendships, finding it difficult to move on and forge fresh bonds with new people, or if they will plunge into adulthood, embracing new opportunities while maintaining constant contact with old friends from back in the day. As I watched graduates from the class of 2011 pose for photographs, then stop to text someone, thumbs a-blazing, I thought about what graduation really meant for me. I was able to go to college and start fresh. I made a conscious choice to stop being “the flirty girl” and reinvent myself as “the studious girl.” Would such a transformation have been possible if I had people from high school constantly reminding me of my flakiness? About how dumb I was in math? About the time I spilled the bong water? Or the time I started cheering “Block That Kick” when our team had possession of the football? Is it possible to move forward and evolve when people are urging you to look back and stay the same? What do you remember about your high school graduation? How do you think social media will impact future generations?